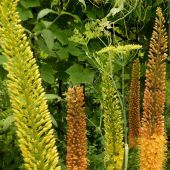 One of the most spectacular bulbous plants, Eremurus is often grown as a cut-flower because its enormously long flower clusters (resembling a bottlebrush) tower up to 8 ft (2.5 m). 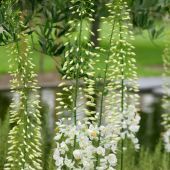 Its long, sturdy, round stems develop in late Spring to become richly covered flower clusters of white, yellow, pink or orange blossoms. The leaves wither during the flowering period so plant its tuberous rootstocks among groundcovers that add beauty. Even though the roots are thick, fleshy and fan out in all directions, make sure to handle them carefully: do not break or bend them in anyway. Especially after a few years, once they are established, the tubers are Winter hardy. 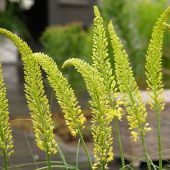 However it is highly recommended to add a layer of mulch and, if the shoots emerge very early in Spring, protect them with straw covered by a basket. In regions with hard frosts and cold temperatures that lasts into Spring, place the plants in a sheltered location for sure. Once planted they do not like to be disturbed and will continue to grow up to 15 years. 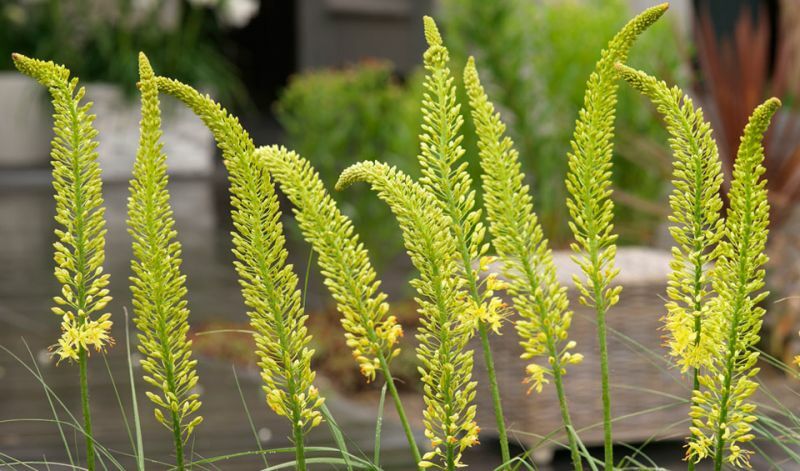 They do need a rich, well-drained soil so add sufficient sand if you have heavy clay soil. Available for planting in Fall in milder climates and in Spring for colder climates.